Glorification of Saint Innocent, Metropolitan of Moscow, Enlightener of the Aleuts and Apostle to America (in the world John Popov-Veniaminov), was born on August 26, 1797 in the village of Anginsk in the Irkutsk diocese, into the family of a sacristan. The boy mastered his studies at an early age and by age seven, he was reading the Epistle in church. In 1806 they sent him to the Irkutsk seminary. In 1814, the new rector thought it proper to change the surnames of some of the students. John Popov received the surname Veniaminov in honor of the deceased Archbishop Benjamin of Irkutsk (+ July 8, 1814). On May 13, 1817 he was ordained deacon for the Irkutsk Annunciation church, and on May 18, 1821, he was ordained priest. The missionary service of the future Apostle of America and Siberia began with the year 1823. Father John spent 45 years laboring for the enlightenment of the peoples of Kamchatka, the Aleutian Islands, North America, Yakutsk, the Khabarov frontier, performing his apostolic exploit in severe conditions and at great risks to life. Saint Innocent baptized ten thousand people, and built churches, beside which he founded schools and he himself taught the fundamentals of the Christian life. His knowledge of various crafts and arts aided him in his work. Father John was a remarkable preacher. During the celebration of the Liturgy, memorial services and the all-night Vigil, he incessantly guided his flock. During his time of endless travels, Father John studied the languages, customs and habits of the peoples, among whom he preached. His work in geography, ethnography and linguistics received worldwide acclaim. He composed an alphabet and grammar for the Aleut language and translated the Catechism, the Gospel and many prayers into that language. One of the finest of his works was the Indication of the Way into the Kingdom of Heaven (1833), translated into the various languages of the peoples of Siberia and appearing in more than 40 editions. Thanks to the toil of Father John, the Yakut people in 1859 first heard the Word of God and divine services in their own native language. On November 29, 1840, after the death of his wife, Father John was tonsured a monk with the name Innocent by Saint Philaret, the Metropolitan of Moscow, in honor of Saint Innocent of Irkutsk. On December 15, Archimandrite Innocent was consecrated Bishop of Kamchatka, the Kurile and Aleutian Islands. On April 21, 1850 Bishop Innocent was elevated to the rank of archbishop. Having begun his apostolic work as a parish priest, Saint Innocent completed it as Metropolitan of Moscow (January 5, 1868—March 31, 1879). By the Providence of God on January 5, 1868, Saint Innocent succeeded Metropolitan Philaret on the Moscow cathedra. Through the Holy Synod, Metropolitan Innocent consolidated the secular missionary efforts of the Russian Church (already in 1839 he had proposed a project for improving the organization of missionary service). Under the care of Metropolitan Innocent a Missionary Society was created, and the Protection monastery was reorganized for missionary work. In 1870 the Japanese Orthodox Spiritual Mission headed by Archimandrite Nicholas Kasatkin (afterwards Saint Nicholas of Japan, (February 3) was set up, to whom Saint innocent had shared much of his own spiritual experience. The guidance by Saint Innocent of the Moscow diocese was also fruitful, by his efforts, the church of the Protection of the Most Holy Theotokos was built up into the Moscow Spiritual Academy. “The steps of a man are rightly ordered by the Lord” (Ps 36/37:23). On October 6, 1977, Saint Innocent was glorified by the Russian Orthodox Church. 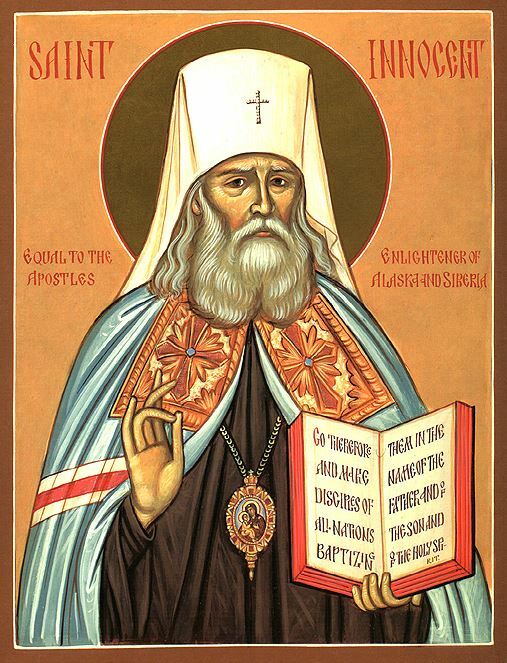 His memory is celebrated three times during the year: on March 31, the day of his blessed repose, on October 5 (Synaxis of the Moscow Hierarchs), and on October 6, the day of his glorification.